A tornado struck Ciudad Acuna in northern Mexico, near the Texas border, killing at least 13 people. Cidad Acuna is just two miles from Texas’ Laughlin Air Force base, the largest pilot training base in the US. 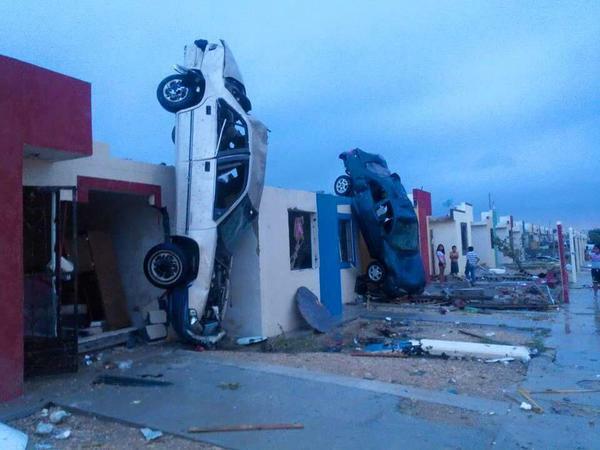 About 300 homes have been damaged or destroyed in Ciudad Acuna, in Coahuila state, according to a press statement from the Coahuila Government. Images from the scene showed cars upended and leaning against buildings. Dozens of people have been injured and officials warned that the death toll could rise. Coahuila Governor Ruben Moreira, on a visit to the stricken area, said 10 adults and three children had died and a baby was missing. Another 150 people had been taken to hospital, he said. “Most of the dead are people who were outside, not people who were inside their homes,” said Ciudad Acuna Mayor Evaristo Lenin Perez. Rescuers were searching the 750 damaged properties for more casualties. Witnesses said a bus had been flipped over by the tornado. “There are cars on top of houses, there are dead people lying in the street, it is total chaos,” said local resident Maria del Rosario Ramirez, quoted by Mexican newspaper La Jornada. Victor Zamora, Coahuila’s interior secretary, said an area of about seven blocks had been “devastated” by the tornado, which struck at about 06:10. The interior department said state officials were coordinating a response. Severe weather is also affecting southern US states including Texas. A dozen people are missing after flash floods struck the Blanco River in central Texas on May 24. The floods also damaged hundreds of homes, some of them swept off their foundations. A tornado damaged a block of flats in Houston over the weekend.